Today's leaders require instant access to the pulse of their most critical asset: people. We have designed a user-friendly, mobile software that enables leaders to stay on top of a dynamic workforce with real time feedback. We collect ongoing feedback from employees, so you can monitor engagement levels and diagnose where low engagement risks impacting business results. 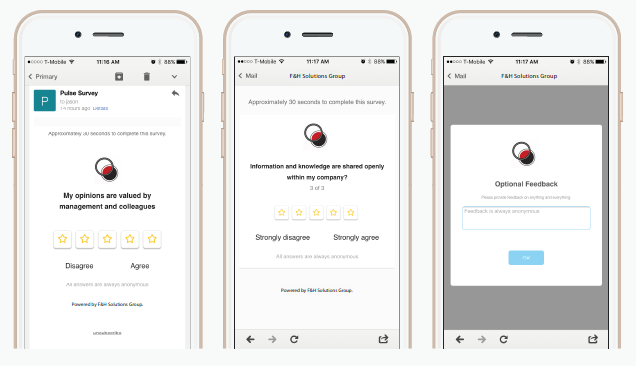 Our Pulse Surveys are designed to be frictionless experiences for the user, taking only seconds to complete, whether on the go or in the office. Each week, your employees will receive an email with 1-3 survey questions followed by an invitation to provide additional feedback. F&H Solutions Group Surveys are always anonymous, and are designed to promote high participation rates. Our advanced survey and engagement techniques leverage familiar web and mobile technologies to collect ongoing sentiment feedback from employees. Role-based dashboards distill feedback into analytical data for leaders diagnose where low sentiment risks operational performance. We provide leaders with the people analytics to amplify the pulse of your company.